Neighbours turn out to surprise a Swindon woman who uses her own tragic experience to help others. 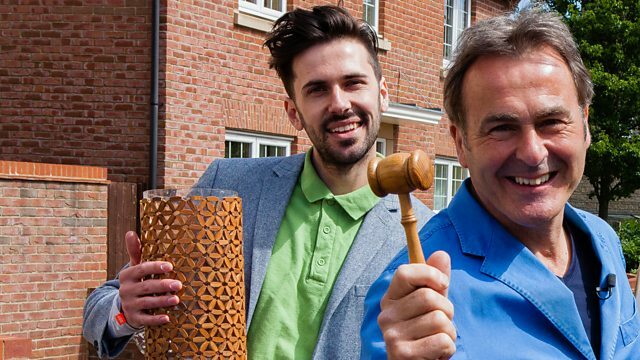 Presenters Paul Martin and Danny Sebastian sort out the auction. Browse content similar to Toothill. Check below for episodes and series from the same categories and more! but possibly never come together as a community that often. money for one very special person. Her name is Jacky, she is a pillar of the community. when she lost her younger brother to suicide. I just phoned the police. the police had found him. a charity to help others who are going through the same thing. you know, their sons or daughters. It's hard. and Jacky's got that big heart to deal with these things. and a gift for her community. ..to get anything we can sell. -This is like Christmas now. -We've got Ming Dynasty here. But it's not all going to be plain sailing. -I haven't got any junk in here. -Have you got anything to donate? And how will Jacky react when she finds out this is all been for her? It's all about you. It's all about you. Today, we're in Toothill, an estate just west of Swindon town centre. in the many new factories and offices Swindon is now known for. and a big part of that community is Jacky Parry. What are you having, then, Trev? -you want to be around. -I don't think I've met anyone quite like her. who have lost loved ones through suicide. Jacky is as strong as an ox. She's got to be. I couldn't have done what she's done. To find out more about her, I went to meet her partner, George. -Hello, it's Paul. How you doing? So, tell me a bit about Jacky. Well, she's an absolute diamond, you know, in the community. all the local community things and all the local charity stuff. Yeah, so she's always helping other people? She's always helping other people. Always children and charity first, you know. -Cos she's been through a lot, hasn't she? -It's very hard with what happened with her brother dying. -It's been very hard for her. both lived on the Toothill estate. They were very close. tragically, took his own life. went out together and had a meal and that was our last meal together. She was first on the scene, so it was extremely traumatic. you know, there was just that panic. "are going through what I'm going through?" There's nowhere to go with it. It is in memory of him, for sure, definitely. You know, for sure. So, yeah. for her son, who suffers with his mental health. For me, on a daily basis, it's very much up and down. You don't know from one extreme to the next what he's going to be like. Close friend Lisa knows just how tough things can be for Jacky. the next they could just be haywire. instead of thinking of everybody else. Now, that's going to cost several hundred pounds. This is how we're going to raise it. right here on the street. is keeping this a secret from Jacky until after the auction. someone who knows his treasure from his trash. Whoa, right on time, look at that. -Bang on time, how about that? -Punctual me, you know. Punctual. Right, I think quantity over quality. -Because every fiver adds up. to get the best prices. So, I'm hoping for some quality items. -You go that way and I'll go this way. 'Right then, let's get cracking. Someone's got a bit of pride. and they're willing to help. He wants to go in and get some milk. -Oh, I'd better watch my ankles. They're very small people here. But it's much tougher than I bargained for. -you've got anything to donate. -Not at the moment, no. I'm starting to feel despondent. but look at these. They're absolutely beautiful. lovely pictures of peacocks on the front. I think they're quite saleable. 'Don't suppose you have anything to donate? Some nuts? Do you know, at this rate, there won't be a street auction. We won't have anything to sell. Which means we let Jacky down, which is not good. Perhaps we need a change in direction. Which way do I go? Decisions, decisions. Danny is heading to the local shop. That could be a clever move. -I'm going to be in all day anyhow. -You're going to be in all day? -If you could just jot down your address. -Do you want to write it? -No, you write it. I'll let you write it. Well done, Danny. At least you have an appointment. -I got rid of all mine. -You got rid of it all? Oh, shame. OK. Well, it's nice to meet someone who's in. Right, the street isn't working for me. I'll head over to the village centre, too. It's where Toothill's community centre is based. And I found Lisa, a good friend of Jacky's. and it's about time she was recognised for it. Yeah. And this is what we're doing. Can you help me? -..at my mum's house that you can go and rummage through. -We found you, Jenny. We have found you. -Shall I take my shoes off? -No, no. I haven't done any house work. Well, it looks very tidy. And I see you got your slippers on. -Oh, yeah. I wouldn't live without my slippers. comfy, haven't you? Hello. How are you? And Jenny's got something just as cute for the bric-a-brac stall. -That's a bit of a toy. -There's a lovely shire horse. -Is it a bit of Beswick? and produced porcelain figurines, such as farm animals. but still could achieve a couple of pounds. -Have you got your teeth in? -Hello! It's Marie, is it? -And I've got all that junk in there. -Give us the key, come on! It's just a load of rubbish. -So, we can have these, can we? These are lovely. These are Victorian. These are what you find in those landfill sites, you know. and I reckon some of these are £2-£3 each. -I don't know what they are. Don't ask me what they are. That's a bit silly, now, isn't it? -Oh, it's a bottle in a case. Oh, that's nice. that stops the gas from escaping. 'This is known as a globe stopper bottle, invented in 1872. I mean, that's worth £2-£3. Over at Jenny's, Danny's hunt has spread to a celebrity front room. -I'll give you my dog. My dog. -And I'll give you my cat. they want good money. These will be going into Paul's auction. but we could get a tenner for the pair. -I wish I could have given you more. Now, I'll stop you there. You've given us plenty. Back at Marie's garage, I found something else. Can we have these? These are lovely. These are earthenware. -They can go. It gets rid of them. Thank you. Have these been in the garden? -They've been there all the time. Good Victorian pottery, it's all Staffordshire, Stoke-on-Trent. All of these things add up. You know, I think there's 20 quid there. Is that something for us? You might as well, cos you're not going to ever use it. That's really nice. A fire iron, a little shovel and some tongs. to hold this little shovel onto the handle. Really nice. I knew she had something that was worth something. -Well, this was worth raiding, wasn't it? 'Marie, you've been an absolute treasure. 'compared to how it started. "For the street auction, please take today if possible. "Thank you. Daphne." She's left her phone number. Well, that's OK, isn't it? that's going to look great. It's like an old pub table. It's sort of 1980s. It'll be worth 20 quid with a coat of paint on it. Someone else has left something with a note on it, look. This is like Christmas now. ..with a herd of elephants. Well, that's a good furnishing picture. 'The neighbours are really coming up trumps for Jacky. So, where shall we start? What have you got for me? That's quite nice. -Shall I reach up and get it? Simple oil lamps have been used since the Stone Age. My mother acquired it from my great aunt. Well, I'll tell you what, it's quite nice. It's quite decorative. Nice base on it. We're quite lucky to have the shade still on it. -It's nice. It's been looked after. but so will some pieces from Maureen's glass collection. Oh, yes, please. That's lovely. Very decorative. A nice heavy lump that. Bit of art glass. pop-up auction, while Danny is headed upstairs for more donations. We've got some Ming Dynasty here, I don't want to drop it. Maureen's got another way of getting them downstairs. You'd be surprised what goes up and down on that. have it in the bathroom. Just ornamental. And, of course, we've got a lovely pottery vase. Nothing special. he might well say that they are going to a top auction house. I'll have a look, Maureen. After all, you're donating all your stuff for your friend Jacky. seeing each other at least once a week. She has fond memories of him. He was just a really... what I'd call a lovely guy. Very genuine. Would do anything for anybody. He was just really sweet. He really was a really sweet brother. He loved us all. He was just a very caring guy. but she didn't know just how serious. You know, you just think that they're all OK, don't you? Your family. But he was struggling. We all, as a family, went out together and had a meal. He went home that night. I went over to see him at the flat, banged on the door. Tried to break in, but all the curtains were closed. and I just phoned the police. and that's when the police had found him. Paris' death had a devastating effect on Jacky's family. It leaves a massive crater, a massive hole in everyone's heart. diagnosed with depression, post-traumatic stress and anxiety. He needed Jacky's full-time care. He has gone through those dark times. And there are times where he just doesn't want to be here. I had to look after him as my priority and he's my boy. full-time for her own son is a huge personal struggle. There'd days where I'd be OK and there'd days when I just wasn't. "That's it. I'm not going out today. "I'm not venturing out. I can't be bothered." could help others and she was compelled to do something. a daily basis and there is nowhere, there's nowhere to go with it. that I was going through. I've sat in group and I've heard mothers weep. It gets me. ..you know, their sons or their daughters, it's hard. 'Back on the street, I found Miriam.' Hello! -And it really had a terrible effect on my aunt. -She could have done with some help, I think. Yeah, so we're going to help her. -Can we sell these on our stall? -And then can I auction off a free commissioned painting? -Could you donate a painting if you paint it? Oh, we can paint these. -Yeah, that was my grandmother's. Yeah. Is that what you just got out of the attic? -You said you were going to get some stuff out of the attic. On another street, Danny's been drawn to a house with a vintage van. Will owner Les have anything for us? -Come on in? I've wiped my feet. Now, that sounds good. Oh, what's that? Oh, a toy one. I thought you meant a real one round the back. I'll tell you what, she's a heavy one. -That's James Bond, isn't it? but Les might have kept the best till last. -That is a nice bike. -What does that stand for, do you know? I don't know. What are you asking me for? I want to learn it. -Well, it's all a learning curve. but suffice to say this vintage bicycle is a great find. I mean, what would it be? 1930s? I've been told it's 1947. Look at that moving mechanism. I'll tell you what, they just don't make bikes like this any more. I'll tell you what, I've come in a car - I'll be going on a bike. I think Danny's on it. -You know we're raising money, don't you? -You do. And do you know Jacky? Yes, I do, cos I'm trustee on SOBS with her. -Oh, are you? So, you work on the charity as well? will give that to that person. -because they're all at different stages in their journey. I'm amazed by how she manages to get it all done. and she's always got her phone with her, for her SOBS group. She could be anywhere and the phone could ring. their life has now taken. Julie has now been going for the last six months. She's available on the phone if we need her. and, to me, she's one in a million. and is getting more people to understand. Friend Lisa knows Jacky's a special person. I couldn't do what Jacky does, never in a million years. and Jacky's got that big heart to do all of these things. to see a promising future. In your weak times, that's when you're strong. You don't see it at the time, but you are incredibly strong. and how to generate good memories and have fun. but it's also carving out some really good memories. 'because she's outside the community centre. Hi, I've brought all of my tat with me. We found these all in the garage so we thought we'd bring them up. Oh, bless you! So, how long have you lived here? -I've lived here 27 years. -Yeah, I know. It's good. -And what you do for a living? -Well, I used to run my own business. -Oh, are you a florist? so I had to give it up and then be a carer for him. cos I lost my brother to suicide. And, obviously, this makes a difference in the community, then? -The pressures of modern day life. It is. I would say so. When my brother died, it was the credit crunch. When people were losing jobs or couldn't find work. And that is that thing about what's going on in the world. If you are in a community, you've got to help. -You've got to get stuck in. -You've got to, kind of, be there. What's the point of being in a place? and support within the community. -But I think that's nice, the oil on canvas. It's someone that, you know, has a really good eye. I think that's a splash of colour on anybody's wall. -Oh, I had this one. -And "The Kings and Queens of England"! getting all of this lot. and then you'd sort of get the tea out of the box, wouldn't you? -between the lining and the box. This is good. The gardening one, we'll put into our auction. -Someone had the foresight not to glue them down. -You can see they're just tucked in. Yeah, yeah, cos they would rip, wouldn't they? -Yeah, and it's the complete set, and the condition is superb. I think we put that one into auction. That's brilliant. We're going to hang onto that. -So, if you can help out on the day...? -That's OK, isn't it? Fantastic. 'Today didn't start off well, but, boy, has it ended on a high. -A nice little barley twist table. painted, that will look great, so we can upcycle that. I'll tell you what, you've got some art glass there. -That's a nice little lot. I'll put that under the hammer on the pop-up. -Shall we do the dog and the cat? -It would be quite nice, yes. -Put them under the hammer? -That, I think, we can upcycle and paint a bright colour. 'With a lick of bright paint, I should get £20 for that, too. So, the fireside tools - three of them, late Georgian. 'This Georgian fireside set dates from the early 19th century. And all of those Victorian bottles. Yeah? They can go off to auction, and the Wills cigarette cards, look. Out of everything here, the star lot you've found has to be this. they've put new brake blocks on that. And I'll tell you what, look, BSA - Birmingham Small Arms Company. and they thought, "What can we do?" So they started making bikes. 'It's a good British name and it's in great condition. Well done, Danny. You've worked so hard. filled with Jacky's friends and neighbours. The skies might be a little grey, but the bunting is being hung. hopefully the last, because we can't afford to lose anything. Thankfully, our volunteers are here, including Jacky. Hopefully she still hasn't twigged that this is all for her. Thank you so much for turning up today, everybody. I know we are going to have a brilliant day. It's all about the community coming together. Isn't that right, Danny? -so you'll want to do plants. -Yeah, I've got the plants. -Who's going to do bric-a-brac today? -Oh, the three of you? Yeah? I'm just thinking, we've got plenty of kids' toys and stuff like that. -Who wants to do kids' toys? -Oh, look, I'll tell you what. You've got a great face for kids' toys. -Yeah. I've just been volunteered. Thank you. With your help, we can do this. I'll tell you what, how lovely is that? A lovely little Ensign. Even got the case with it. Quite nice, that. I've just looked at some stuff that's come in fresh. I've seen a little camera. for the auction this afternoon. Is it a little Box Brownie? I don't think it's a Brownie, but it's that type of thing. 'The Box Brownie camera was invented by Kodak in 1,900. I think we'll give it a go. -It's too nice for bric-a-brac. Probably get 20 quid for that, won't we, Paul? -Hopefully. Yeah, I'd have thought so. We'll give it full exposure, and do you know what? Tarpaulins out, everybody, and take cover. It matches the suit, doesn't it? not when there are boys' toys to play with. The wheels are going. It moves! Look at that! TOY CAR SCREECHES It came to a screeching halt, then. -David Brown, the founder of Aston Martin. And a bit too modern, is it, to really warrant a good price? It is, but, because this is for a good cause, I'm going to push it. You're going to have fun on that rostrum, aren't you? 'then we have a low. 'that's a good-looking clock, but it won't sell now. 'perhaps with our upcycled furniture. 'Remember the round table left outside on the street for us? -It's probably more saleable as it is than what it was as brown. Do you know what? I recognise the shape, but I forgot all about it. -So, for me, that's done the trick. Now you gravitate towards that. You go, "Gosh, that looks different. That looks good." but it's all waterproof eggshell. So, you can put this outside in the garden if you want to. Yes. Well, I mean, it's had a drop of rain this morning, hasn't it? -No! It's tried and tested. All said and done - it's clean, it's fresh. When we found that, we both went, "A fiver." -Maybe even a little bit more. And remember Miriam's barley twist table? limited edition. Look at that. It's just "Street Auction" printed and cut out. Well, it's not just Street Auction. That is classed as decoupage. Basically, that was the Victorian art of scrapbook collecting. on anything, really - and varnished it. -Yes, but that looks well. -And I think this black barley twist table is going to make less. 'We shall see, Danny. We shall see. -Can we have that in our pop-up sale? -Yeah, you can. Yeah, yeah. It's even got its little china casters on it. Look at that. -It's a nice Edwardian piece. 'I think I could get £40 for it. 'Well, I think it's about time we got this show on the road. -Five, four, three, two, one! -and we'll just get people buying, buying, buying. -About £1. About £1, isn't it? -Oh, but don't forget it for a good cause. It's got a nice little brass bit, there, hasn't it? -Look at it. Give us four. Keep the change. How's that? What can I sell you, sweetheart? It's all got to go. and the toy stall is proving a winner. Hey! Guess what my name is? I'll tell you what, there's no flies on this lad. I'll tell you, there's no flies on him. But you can't please everybody. -You don't like them games, do you? to send over to the saleroom? Our auctioneer today is James Lewis. At 40... Well fought, sir. At £10. 15, do I see? At 10, 15, 20 absentee bid, 20 and five. 'Next, it's the Victorian fireside set. Interesting little collection of steel fire irons. It would have been made around 1790, 1810. A true antique. We'll start them at £20 for the three. 20 bid. 25 on the aisle. 50 now. At £50, are you sure? Going once, twice, third and last. 'Someone's got themselves a bargain, but we still have £50. Now, this is the collection of cigarette cards. Would anybody like them for 10? £10, absentee bid at the back at 10. At £10 at the back, and 15 where? Every little helps, but now it's my favourite item, the BSA bike. I hope we can get £50. This is the vintage BSA bicycle. 18 bid. 20 here, and two. 28. In the centre at 30. 50 bid. 50 and five. 'it hasn't been a bad day in the saleroom. all the money, so this is the sum total from the stalls. -Plus the £145 from the auction. -but we can buy something for the community. -So, it's down to me now. 'It would be great to buy something for the community that Jacky loves. 'I'll need to sell big on the rostrum to reach our £900 target. 'But will Toothill dig deep? It's got to be worth £20, surely. 20, anywhere? Come on. Thank you, two hands at once, I'll take 20, I'll take 25. Any further advances? I'll take 30, £30 with me now. 'Up next is the first of our upcycled tables. 'Now, Danny thought this would make between £30 and £40. So, who's going to start me off with a bid of £15? Showing here. I'm looking for 20. I now have it. £20 is with you, madam. 25, can I see 30? 30, thank you, £30. This is what I like, a proper fight going on in the saleroom! Make it 35 now? 35, can I take 40? Any further advances on 40? Fair warning, I am selling. It's going once, twice, sold! £40. Keep your hand up. 'but what about Miriam's upcycled barley twist table? £20 is with me, 22? Thank you. £24. £26. It's against you at the back, madam. £28, it's against you. 30. £30 is with me now. There is a shake of the head, you're out at the back. And I'm selling, fair warning, at £30. It's going once, twice, sold! Thank you. 'Miriam has got her table back. 'those two tables have made £70. 'Up next, a selection of paintings that left little to the imagination! Who's going to start me off with a bid of 30? Thank you. £30. £35 is with me. £35 now, I will sell... Thank you, one more bid, 40. I have a bid of £40 now. I can sell at 40. Sold! 'But what about this painting Jacky donated? £10, anywhere? Is it at 5? Thank you very much, £5. 15? I'll take 15, thank you. Fair warning, I'm selling at £15. Sold! it's going once, twice, fair warning... Sold! you are making a good, wise investment. And I'm selling at £16, this young lad deserves it. I'm selling to you, sir, for £6. Sold! -Thank you very much. £48, sold! 'Wow, what a great price. 'of the day, a real community masterpiece. There isn't another one. You can't put a price on it! 30, straight in, thank you. Now I'm looking for 40. 40, thank you. -Come on, £60? Thank you, £60. 70 anywhere? -Thank you very much. We've got a bid at £90 now. I know we can get £100 for this. And I'm selling at 100, it's going once, twice, sold! Thank you. 'Great price, great community spirit. thank you so much! It's been absolutely fabulous, it really has. I can't believe it. Without you, this would not be possible. Now, I have told one or two fibs. I have. but there is one person here who thinks it's for a community project. community for nearly three decades. she's got people back on the right path, back onto their journey. She is a caring mother, a caring partner, you all know her. Jacky Parry, it's all about you. -"to the Lake District." Really? -Wow, I am just shocked. Well, we've had to keep this a secret from you for a long time. Wow, thank you. Do you know what? I really need a break! I really do need a break, so, thank you so, so much. so I'm just really blessed and honoured to be part of it. -OK, give her a hug! I thought you had sort of twigged that, but you didn't! Yeah, a bit emotional, actually! I can't believe the whole community can come together so well. I didn't think we would get away with that, but we did. the cat could have got out of the bag at any moment. We got away with it and we raised more than our original target. I hope you've enjoyed watching the show. the next time, and this auction could be for you. Goodbye. quality time together on a break away. for the community centre, to keep everyone up-to-date. Neighbours turn out to surprise a Swindon woman who uses her own tragic experience to help others. Presenters Paul Martin and Danny Sebastian collect donated items to sell at a street auction on her doorstep.